A perennial aromatic herb that has thin, pointed green leaves that have a distinct licorice-like flavor. It originated in Russia and is now found throughout the world but is mainly cultivated in France and Italy. Tarragon is a popular seasoning in French cooking and is used with a variety of foods such as vegetables, chicken, fish and in many sauces and dressings. It is best when used fresh but is also available in dried and powdered form. 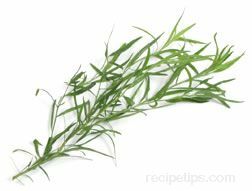 When tarragon is dried it loses some of its flavor and should be crushed in the palm of your hand to release the flavor before using. When using with other seasonings, use sparingly because its strong flavor can be overpowering. Fresh tarragon is available in the summer to early fall, and dried or powdered can be found throughout the year. Store fresh tarragon in the refrigerator wrapped in paper towels and placed in a plastic bag. Dried or powdered should be stored in a cool dry location out of direct light. To chop fresh tarragon, hold the stems and gather leaves into a tight, dense bunch. Using a sharp knife, cut across the gathered bunch to chop coarsely. When all the leaves have been chopped, discard the stems. To mince coarsely chopped leaves, use a sharp knife blade and with a rocking motion, cut back and forth across the leaves until they have been cut to the desired fineness.